Avocado as dessert? Uhh… what?! That was my initial reaction when I learned of the whole foods trick of giving chocolate sweet treats an avocado base; no way was that culinary train wreck going to taste fantastic. A couple of months went by, and I moved into might-be-crazy-enough-to-work territory. And if there is one thing that my vegan home cooking adventures have taught me, it is to never discount food combinations that upon first encounter make you raise an eyebrow. Time to take this whole ‘avocado sweet treats’ thing for a test drive. With fingers crossed, I gave it a shot. The result? Victory! 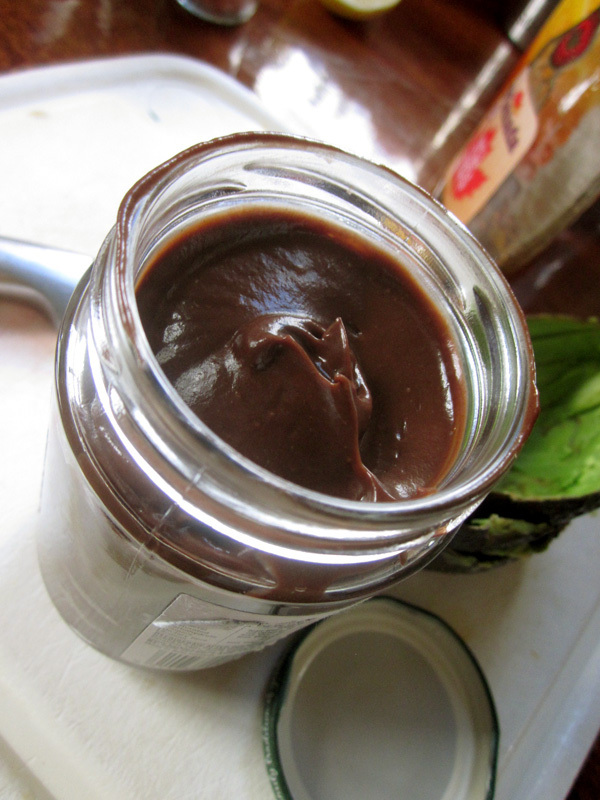 It totally works – chocolate avocado treats take advantage of the creamy, buttery traits and mild flavour that avocados have to make a super smooth, delicious dessert. Using avocado also harnesses a whole lot of nutritional radness that tend not to be anywhere near traditional dessert recipes. As well as being full of good fat, avocados contain over a dozen vitamins and minerals; for example, they are a good source of B vitamins, which fight disease and infections, as well as folate, which is essential for cell repair. This is truly a silky, creamy, sweet and wonderfully rich chocolate confection. I solemnly swear that you will not be able to detect the avocado. Use it as a dip for strawberries, dollop some on top of cake or cupcakes, serve with your favourite dairy free ice cream (mine is Tommy & James’ chocolate flavoured Nice Cream) … or do what I did yesterday afternoon and just eat it by the giant, mouth-watering spoonful. Scoop flesh out of avocados. Add all ingredients to a blender, or use a stick blender and a bowl. Blend until completely smooth. If needed, stop blending regularly to stir the mixture with a dessert spoon; I had to stop-stir-start a bunch of times since my blender isn’t a fan of super thick concoctions, and I don’t have a handheld blender! Totally worth it, though**. 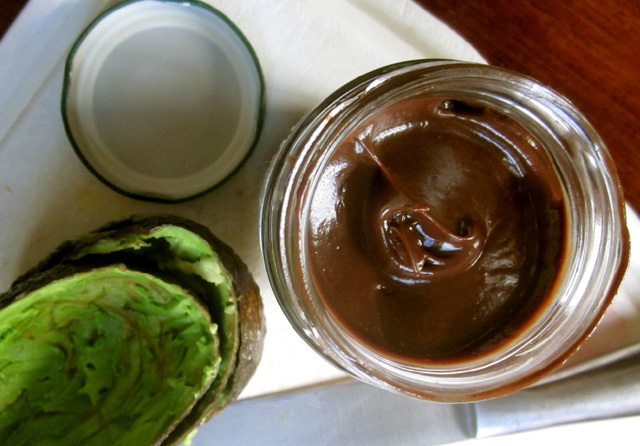 Leftovers are best gobbled up within 24 hours – otherwise you might get some avo flavour starting to peek through; store in lidded jar in your refrigerator (jam jars are perfect ♥). 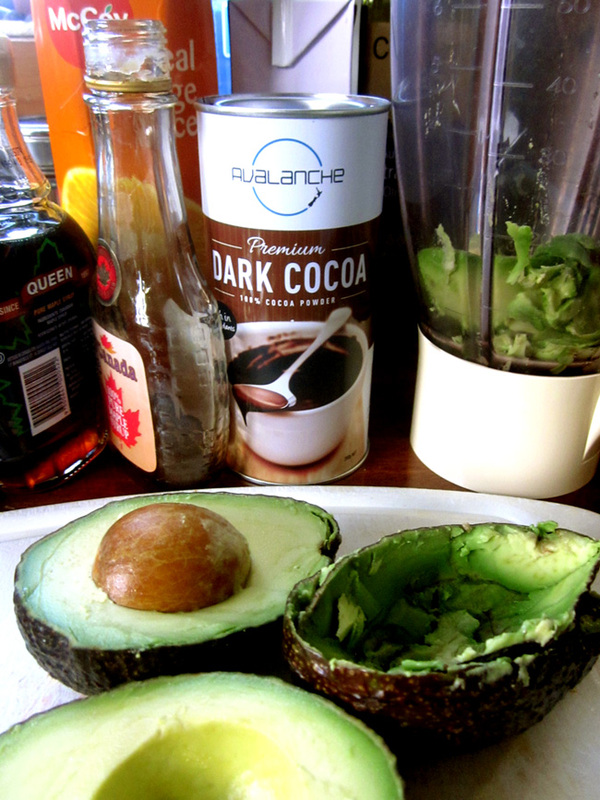 ** Having said that, I do have a little Vitamix envy right now!